The eCompliance AuditTool™ is the only official electronic audit application of the Alberta Association for Safety Partnerships (AASP). The AASP is a non-industry specific health and safety association and one of the largest association in Alberta. This audit protocol is based on the Alberta Employment and Immigration Partnerships in Health and Safety program. A Certificate of Recognition (COR) is awarded to employers that achieve a minimum of 80% when measured against this protocol. Achieving and maintaining a valid COR is based on annual audits and is required to qualify for financial incentive through the WCB’s Partners in Injury Reduction rebate program (5%-20% of a company’s WCB Premium). 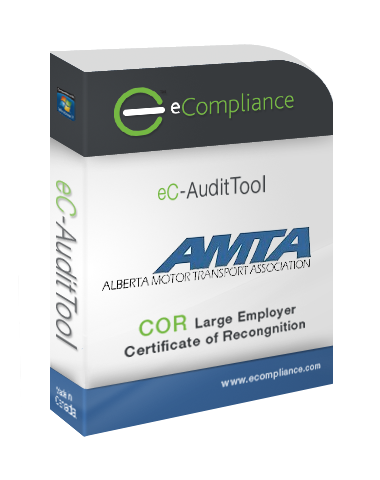 The eCompliance AuditTool™ is the only official electronic audit application of the Alberta Motor Transport Association (AMTA). The AMTA represents all sectors of the highway transportation industry. This audit protocol is based on the Alberta Employment and Immigration Partnerships in Health and Safety program. A Certificate of Recognition (COR) is awarded to employers that achieve a minimum of 80% when measured against this protocol. Achieving and maintaining a valid COR is based on annual audits and is required to qualify for financial incentive through the WCB’s Partners in Injury Reduction rebate program (5%-20% of a company’s WCB Premium). The eCompliance AuditTool™ is the official electronic COR audit application for Enform. Registered Enform auditors can obtain access to this audit at NO CHARGE by logging into the Enform Auditor Support Site. Enform, the safety association for Canada’s upstream oil and gas industry, is the advocate and leading resource for the continuous improvement of industry’s safety performance. This audit protocol is based on the requirements of the Government of Alberta Partnerships program, Worker’s Compensation Board of BC (WorkSafeBC) and the guidelines of the Saskatchewan Joint Industry Committee. A Certificate of Recognition (COR) is awarded to employers that achieve a minimum of 80% when measured against this protocol. Achieving and maintaining a valid COR is based on annual audits and is required to qualify for financial incentive through rebate programs. The Electrical Safety Program Solutions inc (ESPS) Audit Protocol streamlines the completion of the electrical safety audit process. This audit protocol was developed by capturing years of consulting and auditing experience in a comprehensive audit protocol that covers all the phases of an electrical safety program. This protocol has proven to reduce overall audit time for large organizations by months using technology to automate, amalgamate and reuse audit data. 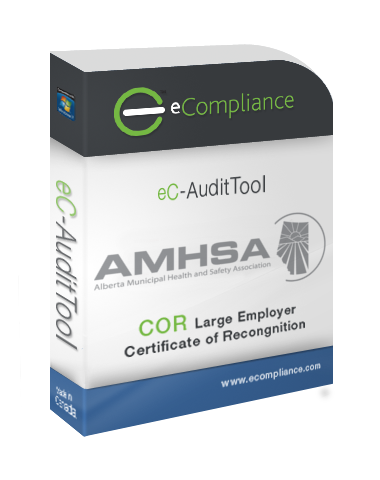 The eCompliance AuditTool™ is the official 2018 electronic audit application of the Alberta Municipal Health and Safety Association (AMHSA). AMHSA represents every town, village, municipal district, county, city and specialized municipality in Alberta. This audit protocol is based on the Alberta Labour’s Partnerships in Injury Reduction (PIR) program. A Certificate of Recognition (COR) is awarded to employers that achieve a minimum of 80% when measured against this protocol. Achieving and maintaining a valid COR is based on annual audits and is required to qualify for financial incentive through the WCB’s Partners in Injury Reduction rebate program (5%-20% of a company’s WCB Premium). The eCompliance AuditTool™ is the official 2018 electronic audit application of the Alberta Motor Transport Association (AMTA). The AMTA represents all sectors of the highway transportation industry. This audit protocol is based on the Alberta Employment and Immigration Partnerships in Health and Safety program. A Certificate of Recognition (COR) is awarded to employers that achieve a minimum of 80% when measured against this protocol. Achieving and maintaining a valid COR is based on annual audits and is required to qualify for financial incentive through the WCB’s Partners in Injury Reduction rebate program (5%-20% of a company’s WCB Premium). The eCompliance Workwell Readiness Assessment was specifically developed for the Ontario market; and is based on the Workwell Core Health and Safety Audit. This application includes more than 400 links to examples, WSIB samples, templates, legislation and training resources. Built with an intuitive and user-friendly interface it provides a step-by-step road map to build an effective OHS Program that complies with Ontario Workwell requirements. Not only does this application assist with compliance, but it also includes the development of an Action Plan to drive implementation and to continually ensure compliance. The result is a Health and Safety program that can demonstrate and prove due diligence to ensure the health and safety of employees as required in terms of OHS Provincial Legislation and Bill C45 (Section 217.1 of the Canadian Criminal Code). For an overview of Workwell and for a narrated demonstration of the application click here. If you have already purchased the audit tool, and you would like to retrieve your license keys, click here to have your licenses emailed to you.